Welcome to our Fun in the Summertime series! You can find the rest of the posts in the series here! And don't forget to enter our giveaway! Two colors of frisbees (at least four of each color) These can usually be found at the dollar store. 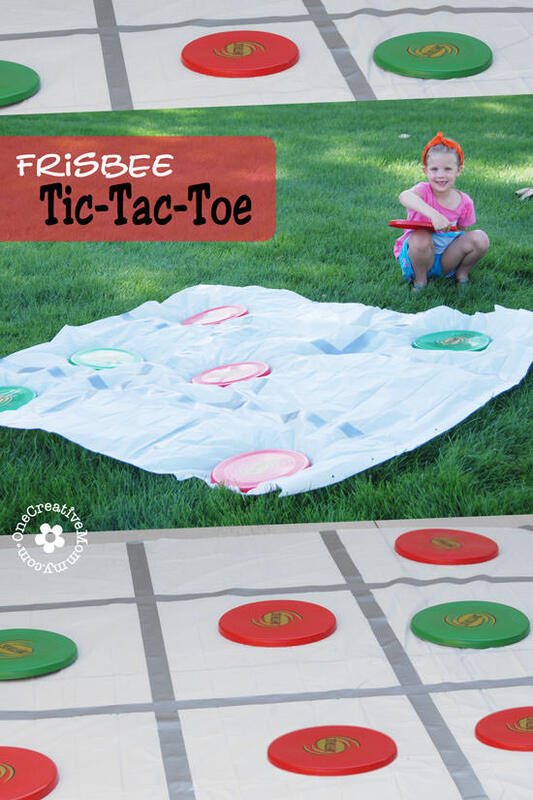 If you'd rather use the frisbees you already have, just use a little duck tape to create two different styles, or simply draw X's and O's with a sharpie. How to Play: The object of the game is the same as regular tic-tac-toe. The first team to get three of their own frisbees in a row on the board wins the game. Divide the players into teams. (You can play one-on-one or with teams.) Each team gets a single color (or style) of frisbee. Teams take turns throwing a single frisbee toward the board (hoping to actually land in the square they aimed for). The game is over when one team has landed three of their frisbees in a row onto the board (up-and-down, across, or diagonally). 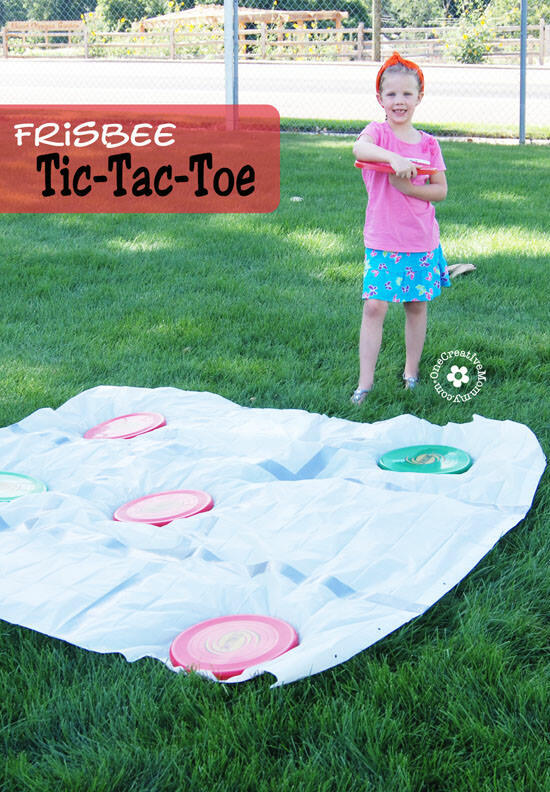 Use a giant tarp to create a huge board for a large group. Continue play and allow either team to claim that square with three in a row. The new frisbee knocks the old frisbee out of play. Now here's the most important instruction: HAVE FUN! Thanks so much to Valerie and Laura for letting me join you today. You can find me any time over at One Creative Mommy, or visit me via social media. I'd love to hear from you! Thanks so much Heidi- that looks awesome! Don't forget to enter our giveaway- and then we will see you here next week for a fun post from Do It All Working Mom! Thanks so much for letting me be a part of your series, Valerie and Laura! Thanks to YOU for a fun idea! We love it! What a great cute idea!!!! Love it! Thanks so much, Rhonda! It was really fun. Thanks, Marilyn. It's so easy that you could even skip the shower curtain and just put the tape on the ground!